I believe in the words of Huey Lewis and the News--it's hip to be square. So for the Mojo Monday sketch challenge this week I went with the square card layout sketch. I had some fun working with the Lattice die and cut it up into four diagonal corner sections to meet the sketch challenge. Then I layered it on four corner sections of black to really punch it out. 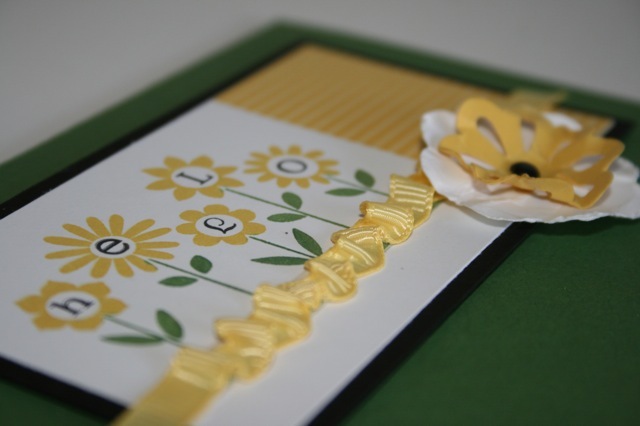 I have added a layered Paper Daisy which is backed with a piece of wool felt. I had a leftover scallop felt piece from a "top secret" project I had been working on for Stampin' Up!, so it worked perfect for giving my daisy so umph. 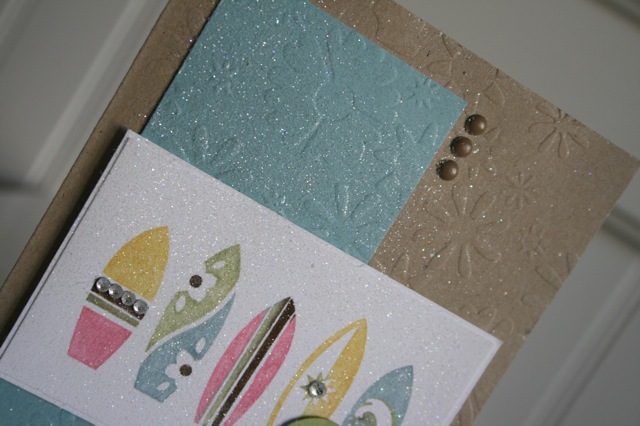 And, as usual, I added Basic Rhinestones and lots of shimmer spritz to make my card super pretty. I included just a little bit of stampin'. 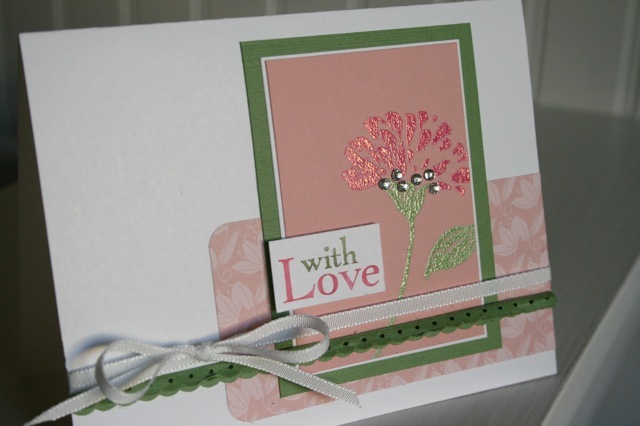 My greeting comes from the stamp set in the Summer Mini Catalog called Love and Care. I really like to layer images and so that is what I decided to do here. It just adds that much more visual dimension. Are you interested in more Summer Mini Catalog ideas? It's not too late to join us on Create with Connie and Mary . We are just starting Week 3, but you still have access to all the projects LONG after the edition is done. You can subscribe for FIVE FABULOUS WEEKS of Create with Connie and Mary for $29.95…that’s over 30 projects…less than $1 each! EVERY project comes with a full step-by-step photo tutorial that you can use in your classes and workshops…or just for yourself! What an incredible bargain! New this session…we have a total of 8 GUEST DESIGNERS sharing their wonderful projects with you, in addition to Connie Babbert, Mary Brown, Rochelle Gould, Debbie Henderson, and myself! The projects we've shared so far are AMAZING and you do NOT want to miss out! Head over to Create with Connie and Mary NOW! 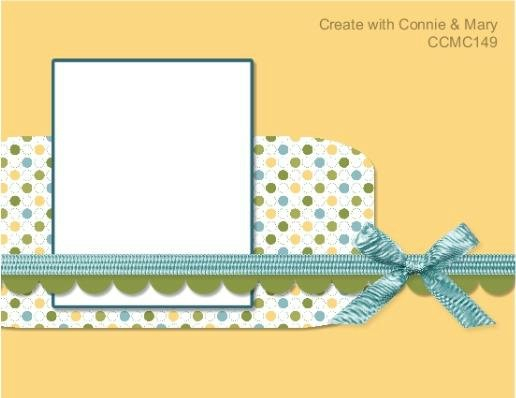 There's a fun sketch challenge to try over at Create With Connie and Mary, CCMC- SUM02. I pulled out my Proud Peacock stamp set which I new would be perfect for the focal panel on this sketch. My color palette is a rich and warm combination of Early Espresso and Peach Parfait with accents of Pacific Point and Pear Pizzazz. For the main peacock image I used a variation of my very own weird technique that I call "Bleeding Images." You can see my original post for "Bleeding Images" here. Now, on to the how you get this subtle colored effect you can see in the peacock feathers. 1. Using markers ink up your image starting with the lightest color first. 2. Stamp the image on a neutral cardstock. I find that Whisper White and Very Vanilla work best. 3. Clean stamp and reink with a dark color. I used Early Espresso. 4. Using a Stamp-a-ma-jig align the image to stamp slightly offset from the original stamped image. Remove imaging sheet and stamp. 6. When completely dry stamp the A to Z image down the right side of the panel. 7. Spritz the panel using the Art Air Gun for the delicate splatter flecks. 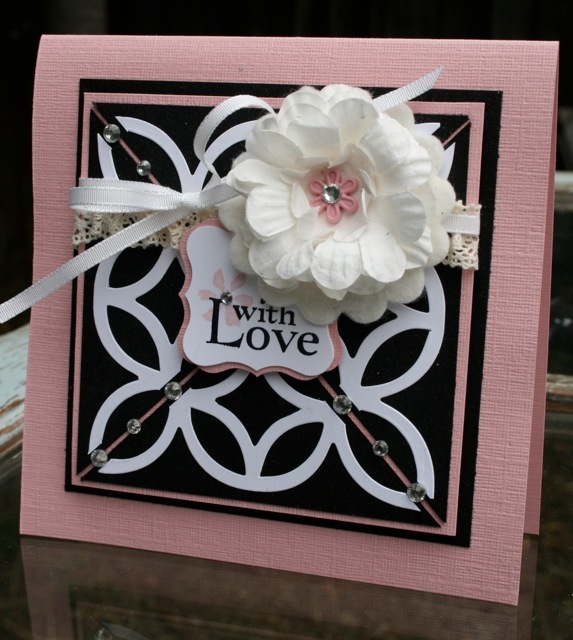 You can see lots more fabulous stuff at Create with Connie and Mary's site today. We have had an AMAZING first week over at "Create" and so you know we have challenges on Saturday for our subscribers. When they participate they are entered to win one of two $75 gift certificates, or one of two FREE subscriptions to Create with Connie and Mary Holiday Edition. That could be YOU! 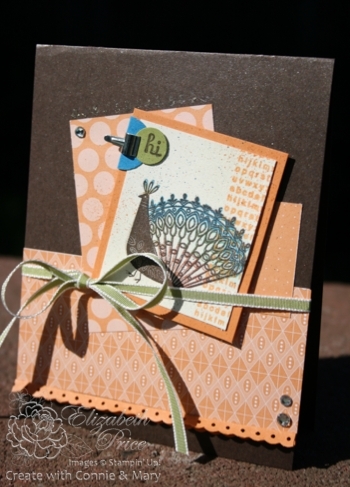 I like to challenge myself and create projects without using the "star" or main focal image of a stamp set. And that is my story for this happy yellow card. I started with a 6" x 6" Basic Gray card base and folded it in half. Then I cut a 2 3/4" x 5 3/4" piece of Daffodil Delight DSP from the Brights Stack and took a bite out of the side using the 2 1/2" Circle Punch. 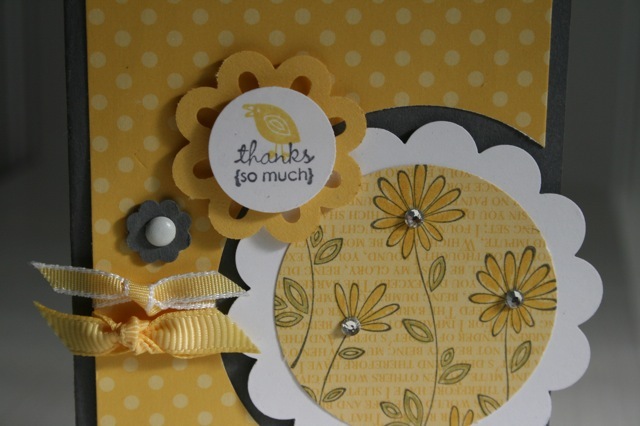 For the focal point I stamped the floral image several times on another piece of Daffodil Delight DSP using Basic Gray Classic Ink. I colored the flowers in with the fine tips of Daffodil Delight and Pear Pizzazz markers. The greeting comes from the Tiny Tags stamp set and the "Partridge Family" bird is an accent piece from the Peacock set. It is layered on the new Blossom Bouquet punch. 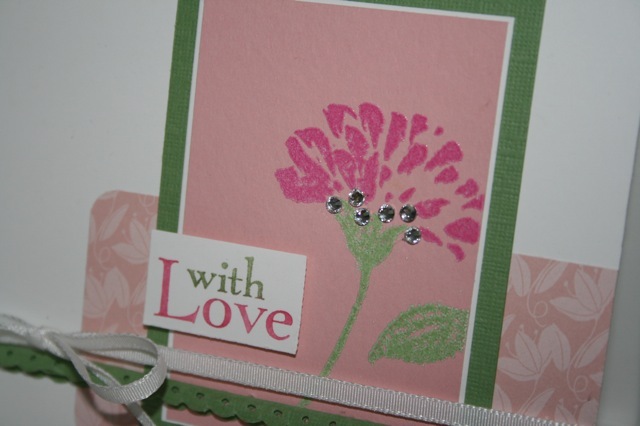 Basic Rhinestones are the finishing touch on the flowers and in the upper corner. Do you need more ideas for products found in the Summer Mini? Don't forget to head over to the Create with Connie and Mary site and subscribe for the Summer Mini Edition underway now!! Don't worry, you will still be able to see all of the projects that we have done as well as all the projects from the coming 3 1/2 weeks no matter when you subscribe! I love Grunge Rock and roll! It is such a fun lively stamp set when you are in the mood to be loud and funky, or bright and sparkly. 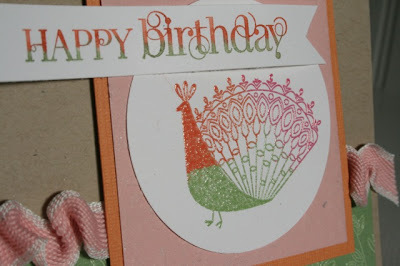 First I started with the A to Z single stamp to add to flair and stamped dimension to my card panel. I inked it up using Silver Shimmer paint and a sponge dauber. I was NOT thorough when I inked it up and even LESS thorough when I stamped it. In fact, I put the stamp on it's back, put the card base on top, and then touched the cardstock here and there with my finger tips in a "typing" motion. I have named the technique "hit and miss." 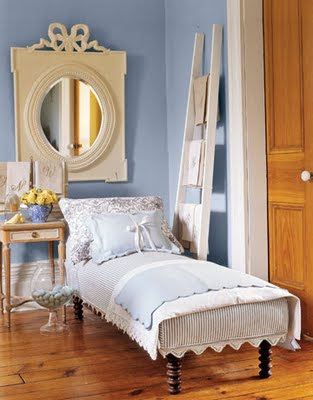 When creating a vintage shabby chic look, or a gasoline grunge style this "hit and miss" technique is a must. For the crazy focal panel I had fun stamping and punching and then layering. My color palette of inks and cardstocks include: Basic Gray, Pacific Point, Old Olive, and Pumpkin Pie. The card got two finishing bits of bling and a spritz and spray of ink using the art air gun. 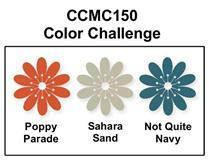 There's a fun color challenge to try over at Create With Connie and Mary, CCMC SUM01. 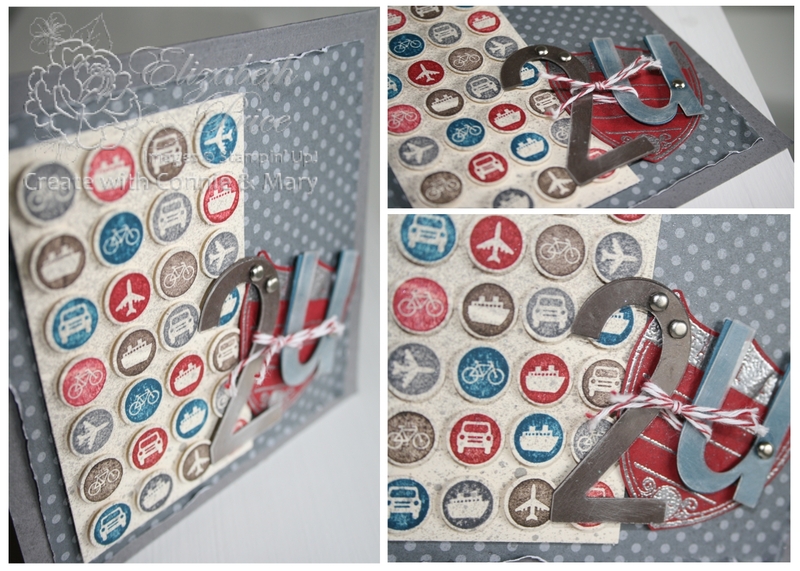 For my card today I have used the fun and fresh Travel Log stamp set. I definitely was going for a more masculine look as the colors for the challenge are perfect for guys. I had my husbands birthday in mind when I was making this. At first I had an "h" and a "b" but they were just not working, so I tossed them aside and just included the "2 u" for a more is less approach. Take a close look at those letters which are cut from heavy window sheets and then sanded to create a frosted appearance. I lined each letter with a piece of cardstock too to help the letter stand out. The side panel of circles feels so cool. Each circle was punched using the 1/2"' Circle Punch and then is raised with a single dimensional. 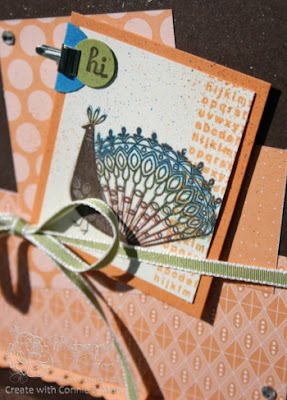 This card is way textural and super fun in person. It has a grunge-shabby guy look. That's right I have coined a new style, you heard it here first, and it's GASOLINE GRUNGE. I think it is totally cool sounding and it represents everything greasy, oily, messy, smeared, textured, splattered, industrial, and layered. The inspirations for this new style (GO AND EMBRACE IT) are vintage gas stations, American Pickers, and American Restoration. Have you seen those tv shows. I have and not because they are my favorites, but because I don't have control of the remote! In any case we now have a new style. 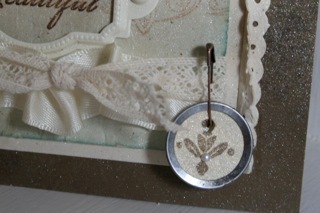 My card features the Engraved Greetings stamp set and if you look close you will see the background stamp Sanded. 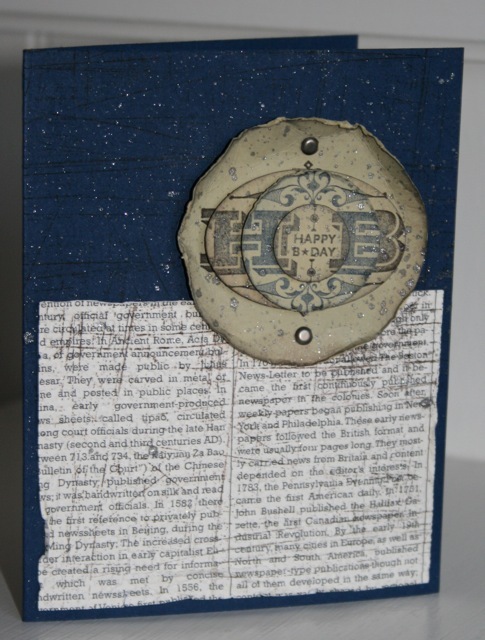 I thought my focal point was a clever use of one stamp to create a some interest. My favorite part of the card is the added splatters/overspray of shimmer paint. 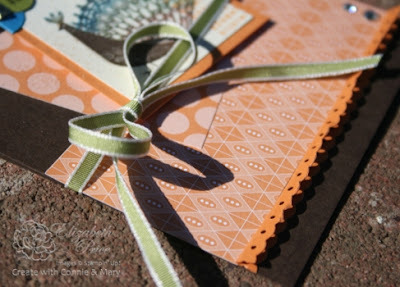 check out the FREE tutorial and BLOG CANDY going on today. You do NOT want to miss out on this Edition. To find out more click here. 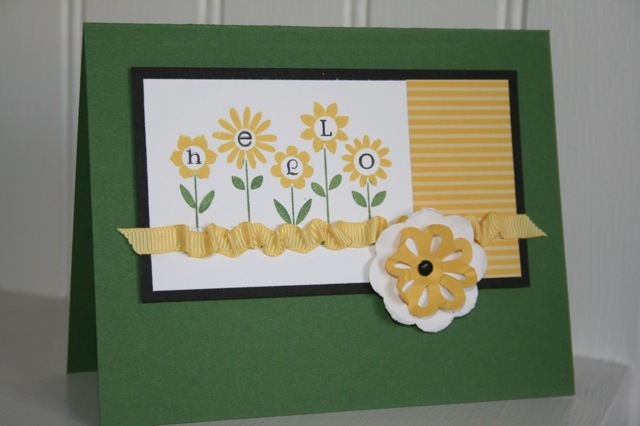 For today I have posted a card made using the Hello Blossoms stamp and the Blossom Bouquet Triple Punch, both are brand new products from the Stampin' Up! Summer Mini Catalog. Do you need more ideas and tutorials showcasing the new stamp goodies from the mini? Check out what we have going on at Create. The preview week (ie. 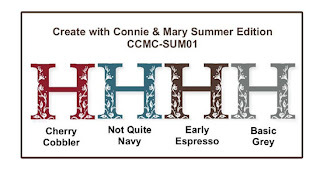 sign up for the Summer Mini Edition and save $5) ends TODAY so don't delay...head over and sign up now....trust me, you are NOT going to want to miss out on this exciting Edition from Connie and Mary and the guest designers! We are all busy creating fun new projects for you, all with full tutorials that you can print off and keep forever!! What are you doing? Stop reading this and head over to their site NOW! All the fun and awesome news over at Create with Connie and Mary has made for a very exciting week. Did you check out our surprise announcements? Pretty cool, huh? We are in the middle of our SECOND preview week for the SUMMER Edition and have had FOUR wonderful projects done by Mary, Rochelle, myself, and Debbie with one last preview project to go. All our projects have AND WILL HAVE FULL step-by-step tutorials with photos so it is easy to follow along and create your own from our samples! Right now, we are offering an Early Bird Savings price of $5 off the normal $29.95 price, but just until May 14th @ 11:55 PM! Then it reverts back to our regular price! Check out Create with Connie and Mary to see what all you get with your subscription! And remember, you'll still have access to all the projects and tutorials LONG after the 5-week subscription service is over! BLOG CANDY ALERT! Go to Create with Connie and Mary for more information! 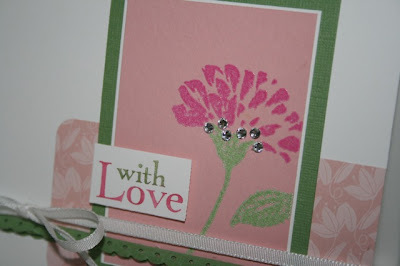 While over at Create with Connie and Mary look at the color challenge for this week. I joined along in the challenge and made a goof. And let me tell you why. When I do sketch or color or inspiration challenges I do them from memory. I thought this challenge had Basic Gray in it as one of the three. I added Saraha Sand for the heck of it, boy was I glad I included it because it is a part of the challenge! 1. 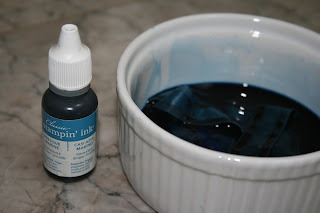 Add several drops of Not Quite Navy Classic Ink Refill to about a ¼ cup hot water. Cut a strip of ribbon and fully saturate the ribbon in water. Place wet ribbon into ink and water mix. Let sit a few minutes. 2. 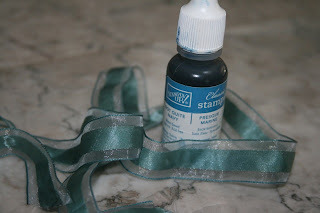 Remove ribbon from dye, rinse, and let dry. 3. Cut a card base from Sahara Sand Cardstock and fold in half. 4. Cut a Poppy Parade Cardstock panel to 4 ¾” x 3 ½”. 5. Cut a Very Vanilla Cardstock panel to 4 ½” x 2 ½”. 6. Cut three 1 ½” squares from Basic Gray, Poppy Parade, and Not Quite Navy Cardstock. 7. 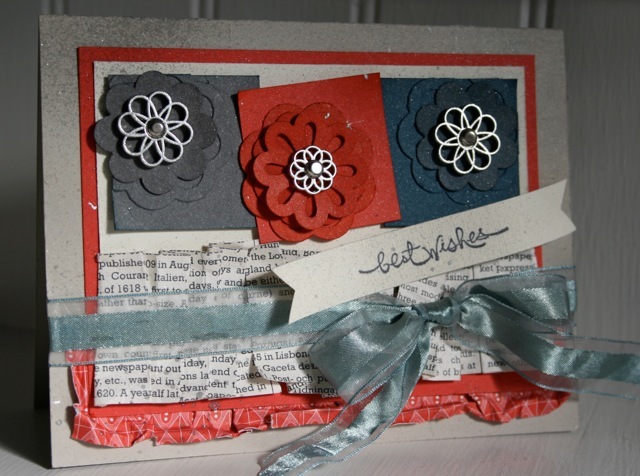 Punch Blossom Bouquet flowers from Basic Gray, Poppy Parade, and Not Quite Navy cardstock. 8. 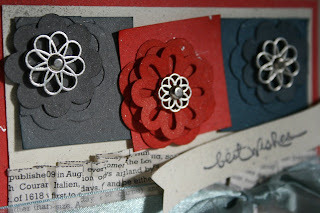 Sponge punched Poppy Parade flowers with Poppy Parade ink and the same with the gray and the navy. This gives a very subtle added bit of visual dimension. 9. 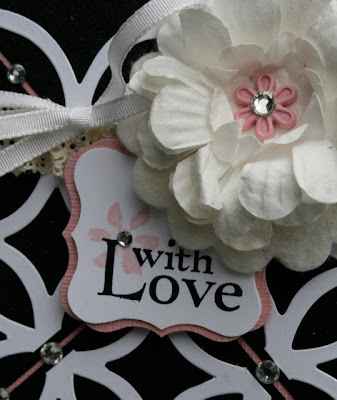 Add sponged flowers to 1 ½” squares and add Designer Filigree Brads. Attached to Very Vanilla panel using Stampin’ Dimensionals. 10. Ruffle a 12” x 1 ½” strip of First Edition DSP and secure to the bottom of the Very Vanilla panel. Attach finished vanilla piece to Poppy Parade panel. 11. Ruffle a 6” x 1” strip of Poppy Parade In Color DSP and secure to the back-side bottom of the poppy panel. Attach finished poppy piece to card base. 12. Tie dried dyed ribbon to front of card. 13. Stamp a greeting from Short and Sweet using Basic Gray ink on a strip of Very Vanilla. Fishtail the ends and secure to front of card. 14. Spritz with Silver Shimmer Paint mixed with rubbing alcohol. 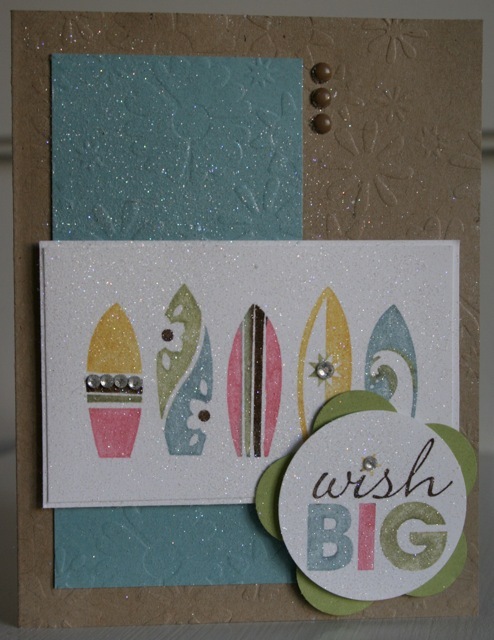 I hope you enjoy my card, now it's time to go check out more cards made using this color combo at Create with Connie and Mary. What do you get when you mix Extreme Surfboard with sponging? You get my card for today! What do you get when you combine spectacular with stupendous? STUPENDACULAR! And there is stupendacular news over at Create with Connie and Mary. So, do a little internet surfin' and see two big announcements and learn more about blog candy!!! Leave me a comment about this post and become a follower of my blog and get a chance to win my own blog candy! 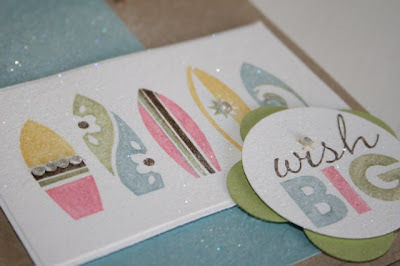 I am giving away a trio of sponged cards with coordinating envelopes just in time for Father's Day. Step 1. 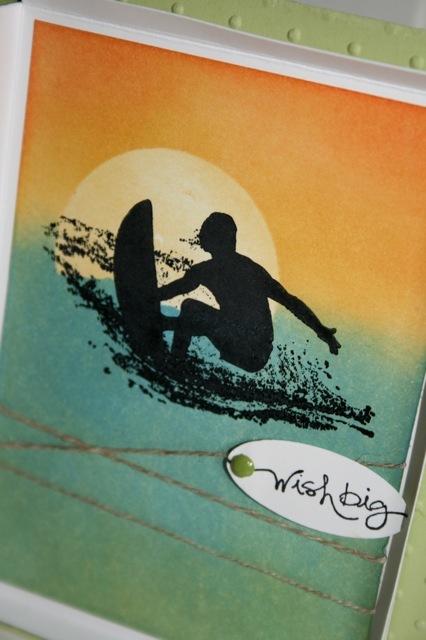 Brayer a whisper white panel with So Saffron ink. Step 2. Punch a circle from scrap paper and rip off the bottom. Step 3. Use a temporary adhesive to secure ripped circle on brayered panel. Step 4. Sponge Marina Mist near the bottom of the ripped circle to create the horizon line. Sponge to about 2/3 to the bottom. Step 5. Sponge Wild Wasabi on the bottom and up to blend the Marina Mist and finish the water. Step 6. Sponge More Mustard to create the horizon line of the sun setting sky. Step 7. Sponge Tangerine Tango on the top and to blend the More Mustard to finish the sunset sky. Step 8. Carefully remove the ripped circle. Step 9. Using Jet Black Staz On stamp the Extreme Surfboard over the sun and across the horizon line. Step 10. Wrap Linen Thread around the lower half of the sponged panel and secure on the back side. Step 11. 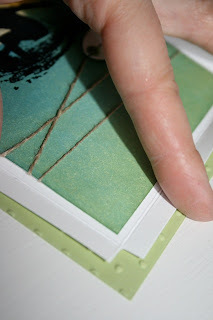 Glue the sponged panel to another piece of Whisper White cardstock which measures 3/8" larger all the way around. Step 12. 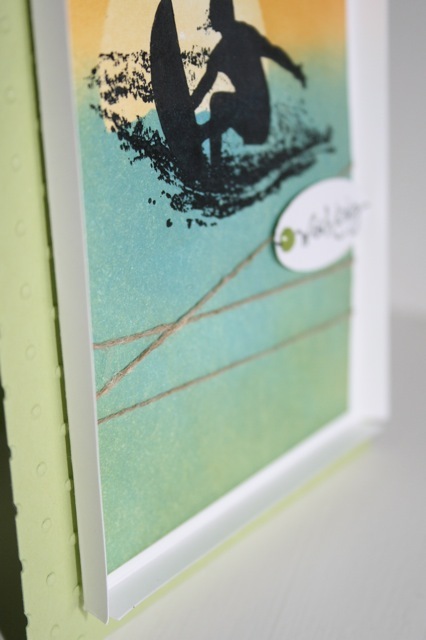 Score each side of Whisper White cardstock 1/4" from the edge. Step 13. Cut out the corners as shown in the photo to the side. Fold all edges up to create the frame. Step 14. 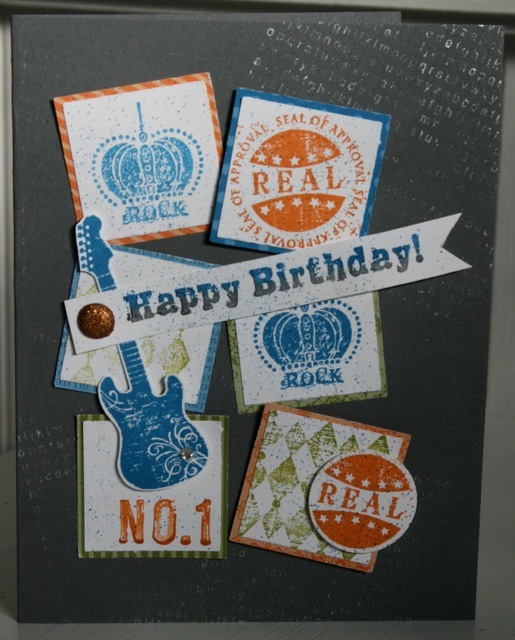 Stamp a greeting from Short and Sweet on Whisper White scrap cardstock using Jet Black Staz On. Punch it out using an oval punch. Add one olive brad and secure to cardfront. Step 15. 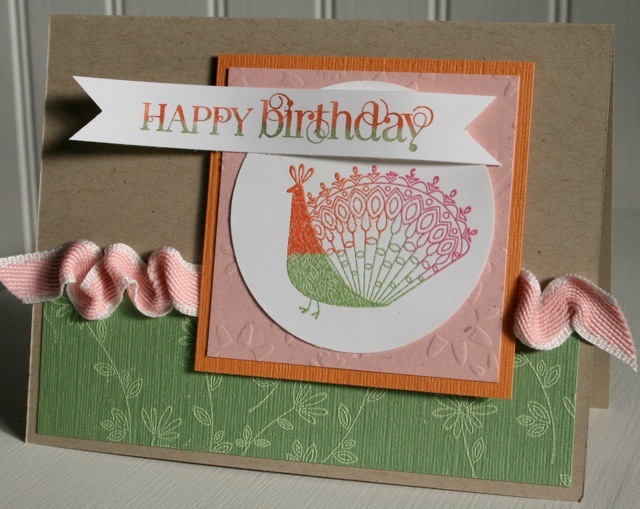 Fold a 4 1/4" x 11" Certainly Celery piece of cardstock in half to create card base. Run the front half through the Perfect Polka Dots embossing folder. Step 16. 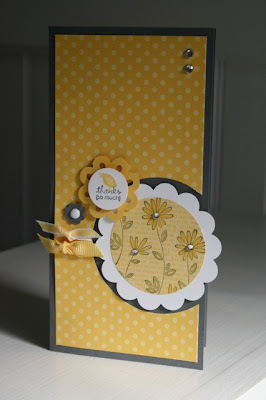 Using Stampin' Dimensionals attach the focal panel to the card base. Are you feeling the need for step by step tutorials? Well I have the place for you. It's the Summer Edition of Create with Connie and Mary. Time is RUNNING OUT on the Early Bird Preview Price of $24.95…$5 off the regular $29.95 subscription price! Your subscription gives you DAILY projects for 5 weeks…GREAT ideas for your Summer Edition projects! Don't you hate it when you figure out you have been singing the words wrong to a song? Well that was me. Even though I was alone and in the shower, I was still embarrassed to be with me! Thinking about this card I wanted to share with you, I was singing a little something like this..."Peacock strut I'm a ladies guy..." I did think something was a bit off so I sang it again, and then it came to me..."it's stray cat strut!!!" In any case here is my Proud Peacock card. The beautiful bird is struttin' in my own little world. And, don't you think he looks fabulous paired with the Elegant Soiree DSP? Speaking of beauty, I have some beautiful news, but I can't share it here. You have to click over (or for today's case should I say strut on over) to Create with Connie and Mary. They are talkin' blog candy and a BIG announcement. Go check it out! 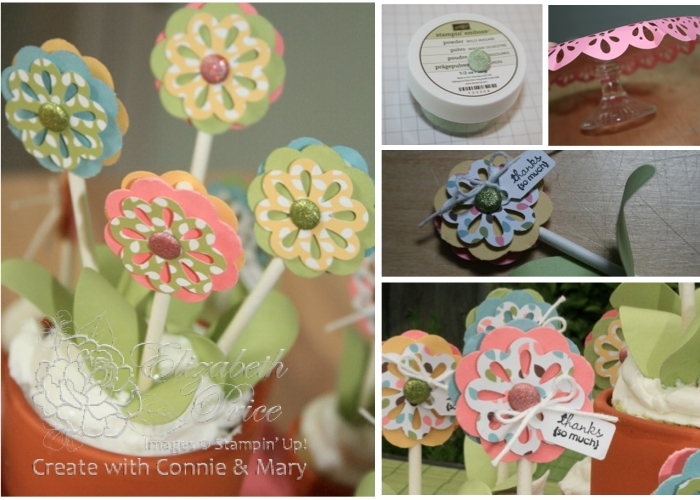 Blossom Cupcake Bouquet Centerpiece AND Blog Candy! 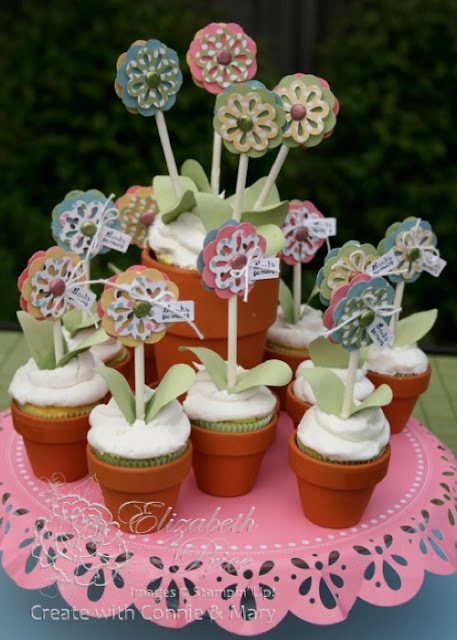 I have put together this fun and easy cupcake dessert centerpiece that doubles as the party favors. These cute cupcakes are super easy to decorate with the new Blossom Bouquet Triple Layer Punch. Have you been thinking about adding this new punch to your stampin' tool box? Do you need more ideas of what you can do with this "three-in-one" punch? 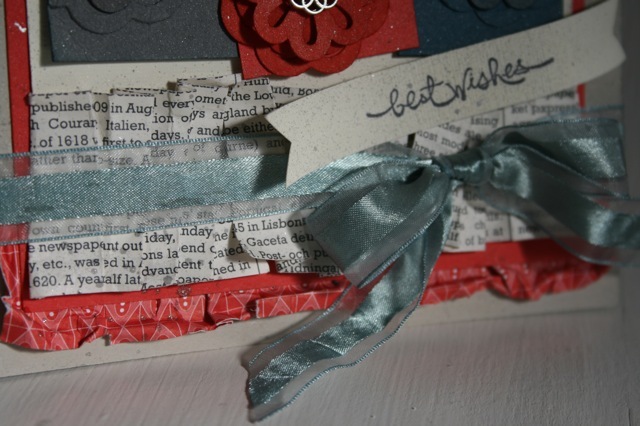 Then keep checking out the Preview Projects over at Create with Connie and Mary. In fact go there to download a FREE tutorial with lots of photos on how to put together the Blossom Bouquet Cupcake Centerpiece/Favors. Now, on to the BLOG CANDY! 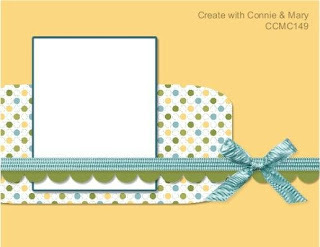 Leave a comment HERE on my site TODAY for a chance to win a FREE SUBSCRIPTION to the Create with Connie and Mary Summer 2011 Edition! From now until May 14th check the site everyday for even more opportunities to win more blog candy. Don't forget to click over and download my FREE TUTORIAL. 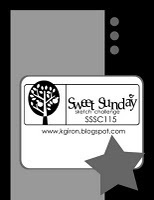 Blog Candy winners will be announced on May 15th over at Create with Connie and Mary. It has been a SUPER long time since I have used Whisper White as my card base, but as the saying goes "nothing like the present." I was in the mood for a cool and relaxed, clean and soft look to complement the floral image on my focal panel, so I grabbed some white. I am not a huge fan of medium cool toned greens, but lately I am wild about wasabi, so I grabbed it too! 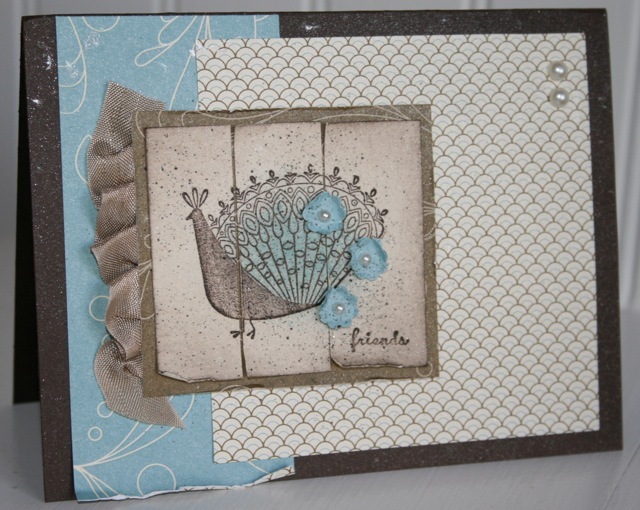 This card came together thanks to the sketch challenge over at Create with Connie and Mary. 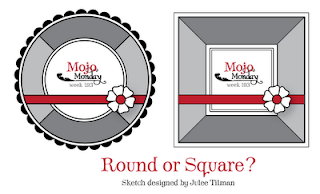 Here is the sketch, now hop over there and join in the fun and check out more projects which incorporate this layout. ...and I should also say shimmery! 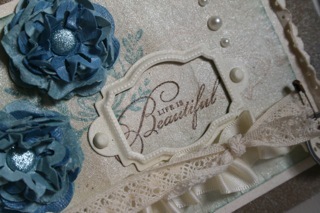 My card inspiration comes from the Shabby Tea Room and their challenge for this week. The photo of the room is so inviting, so I had to join along in the fun. For my card I used a base of Soft Suede cardstock and then I layered two pieces of Naturals Ivory cardstock for my focal panel. 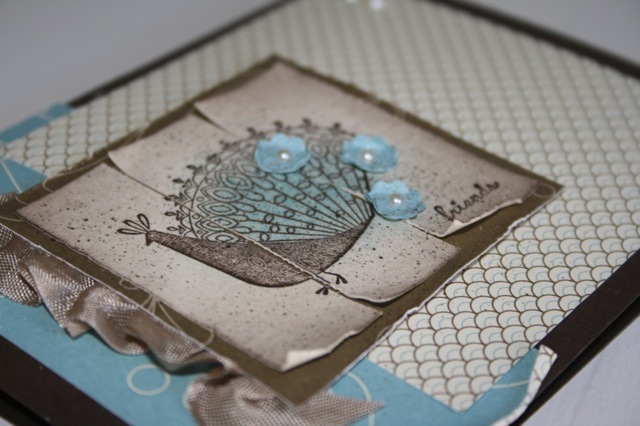 I started by stamping my focal panel with the background images from the Style Beautiful stamp set with Crumb Cake and Baja Breeze ink pads. Then I sponged both of those colors to age the top layer of the Ivory Neutral CS. The perfect touch for the greeting was to add a piece of old hardware I found in my bits and pieces box. The same is true for the ribbons. They are scraps from an old project, but there was just enough to finish my card. 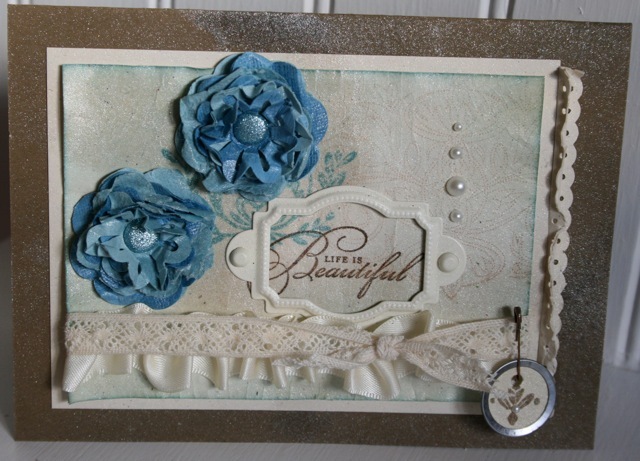 The two blue puffy flowers were made using the new Triple Layer Punch called Blossom Bouquet. It is a brand spankin' new tool that you can find in the Summer Mini Catalog. 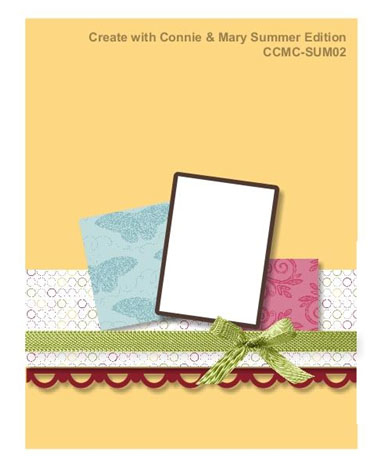 Speaking of the new "Summer Mini Catalog," have you been to Create with Connie & Mary to sign up for the "Summer Edition"? Remember, keep checking at their site as FREE subscriptions are being given away over the next 2 weeks. My preview project is coming soon and it is sweet. So come back soon for a fun treat. How fun and fabulous is this new peacock image. 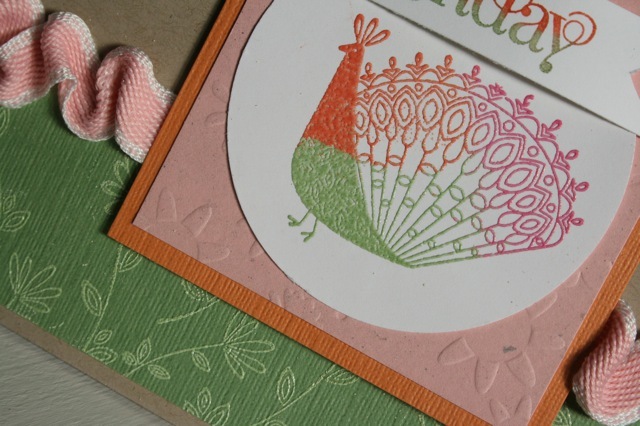 It comes from the Summer Mini stamp set called Proud Peacock. I have mixed it with these brand new AWESOME embossing powders also found in the Summer Mini Catalog. 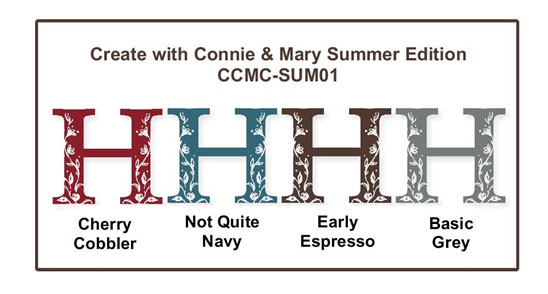 Speaking of the new Summer Mini it is time for the Summer Edition of Create with Connie and Mary. For my card I first stamped my focal image using Versamark Ink. Then I sprinkled the Melon Mambo EP over one section of the peacock, Tangerine Tango over another section, and then the Wild Wasabi over the last section. I heat set the powder and got a fun and flashy look. Wouldn't you say it's perfect for a struttin' peacock? I thought it would be a fun entry for the Paper Players theme challenge of "Birds, Bees, Flowers, and Trees." The greeting comes from a stamp set called Curly Cute. I used Tangerine Tango and Wild Wasabi markers to ink the image for the two toned coloration. I must say I love the color combo of cardstocks which are Blushing Bride, Crumb Cake, Peach Parfait, Whisper White, and Wild Wasabi. In fact I think this might just be my go to color combo for this summer. How about you? What is your color combo for summer 2011? 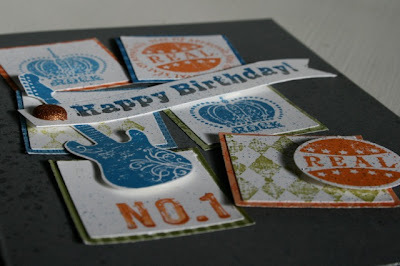 For more cool ideas using new Stampin' Up! products check out the fun details about Create with Connie and Mary. ...will be sharing exclusive projects complete with instructions in downloadable tutorials! Plus there are scrapbook Tuesdays and stampin' challenges on Saturdays. Each and every day there is awesomeness going on. From now until May 14th at 11:55 p.m. you can take advantage of the special pricing of $24.95 - that's $5 off the regular subscription price of $29.95! During these two weeks (on special days), each design team member will be sharing a FREE Preview Week Project complete with a downloadable tutorial. 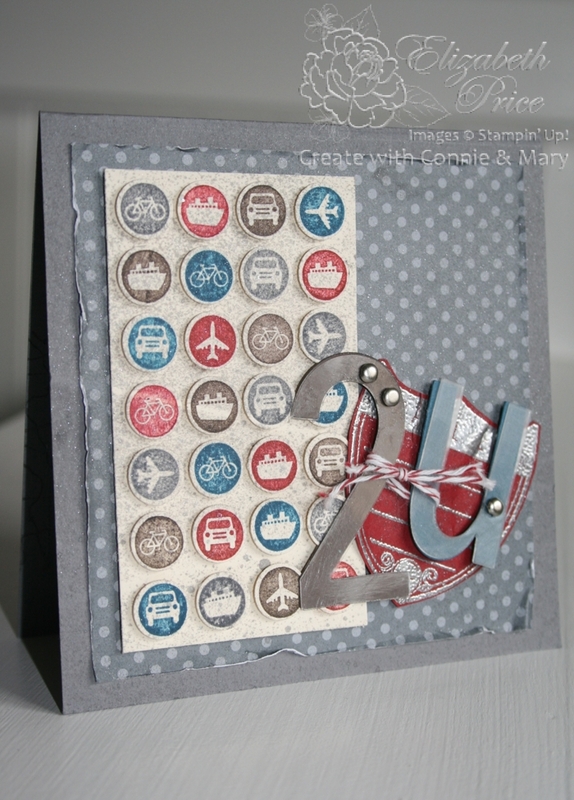 The preview weeks give you an idea of what Create with Connie and Mary is all about! When one of the design team members is showing their Preview Project, they will also be offering BLOG CANDY on their site. The only way you'll know if it is a special Preview Project day, is to check the Create with Connie and Mary site daily to see what is happening and which blog to visit and get a chance to win one of SIX FREE SUBSCRIPTIONS to Create with Connie and Mary Summer Edition! If you are a winner of the blog candy and you have already subscribed, your subscription fee will be refunded. Winners will be announced Sunday, May 15th at 12 noon EST! Or, should I have titled my post Surfin' Up!? 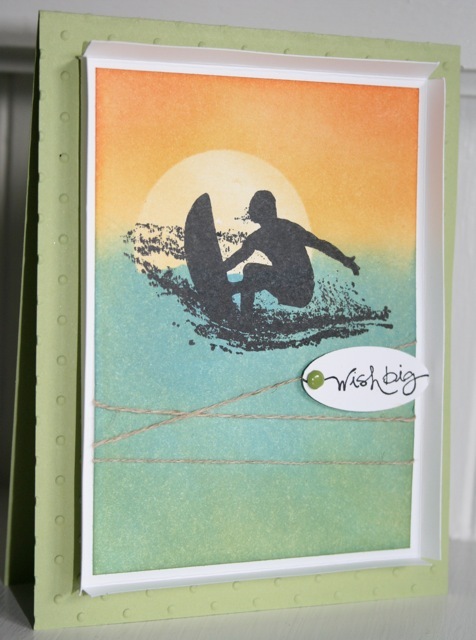 I just am totally, like dude, diggin' this surfboard stamp from the new set called Summer Splash. This card came together super fast with the help of the Sweet Sunday Sketch. 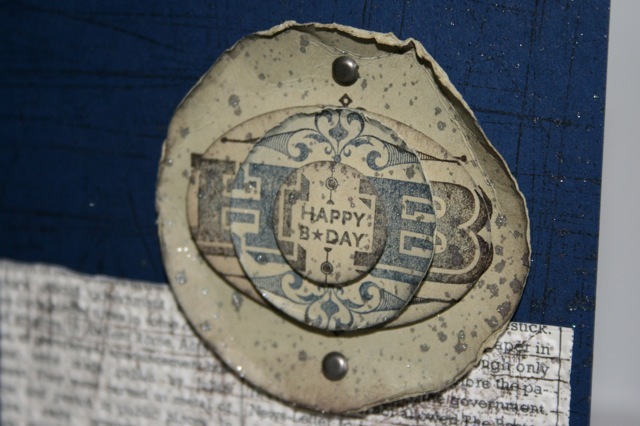 I started with a Crumb Cake card base and then I ran it through the Big Shot and a texture plate. I then added a panel of Baja Breeze which is also texturinzed with the same plate. If you look close you will see I layered the surfboard panel on a second piece of Whisper White; it just needed some extra umph. I used five markers (Baja Breeze, Pear Pizzazz, Daffodil Delight, Regal Rose, and Early Espresso) to ink up the surf boards and a few Basic Rhinestones for a bit of bling. Neautral Brads fit the color combo perfectly so three were included to mimic the sketch challenge. When I was finished with the card I sanded the entire front with Dazzling Diamonds Glitter.